The North Bend Train depot is located in North Bend off of McClellan Street. The depot includes a ticket office, meeting rooms and restrooms. There are also restrooms and a small picnic area outside the back of the depot. Visitors can buy tickets from the North Bend Depot to ride the train from North Bend to Snoqualmie and visit the falls. While in Snoqualmie, they can take a break from the train and visit the town and the Northwest Railway Museum, located at the Snoqualmie train depot. The train runs weekends and is fun for the whole family. For more information about the North Bend Depot, click HERE. For more information about the train schedule, click HERE. 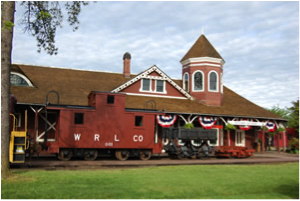 For more information about the Northwest Railway Museum, click HERE. 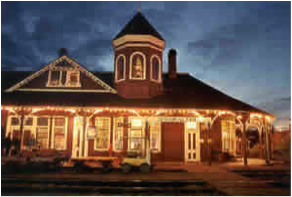 The North Bend depot is also a great place for meetings, workshops, training sessions or small weddings or receptions. For information about reserving the depot for your next event, please click HERE. 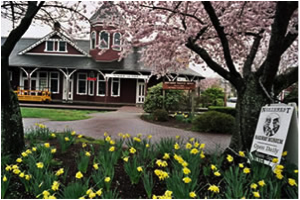 The historic Snoqualmie train depot is open 7 days a week from 10 a.m. to 5 p.m. There is no admission to come visit the depot. If you are coming to ride the train, you get the opportunity to purchase tickets from the 1890 original ticket window. And you can also walk around the old waiting rooms and freight rooms as you wait for your train to arrive, or you can just stop by to learn about the history of the railroad in the area. The train runs on Saturday and Sunday. You can purchase tickets at the Snoqualmie depot or the North Bend depot. The five mile ride is about a 75 minute excursion and it gives visitors the opportunity to visit each town (and get off and explore if desired), as well as see an overlook of the Snoqualmie Valley near Snoqualmie Falls. Tickets are $10 for children (ages 2-12), $18 for adults (13-61) and $15 for seniors (62 and older). For more information on the train schedule and special events throughout the year, click HERE. And if you’re interested in learning more about the museum, click HERE.